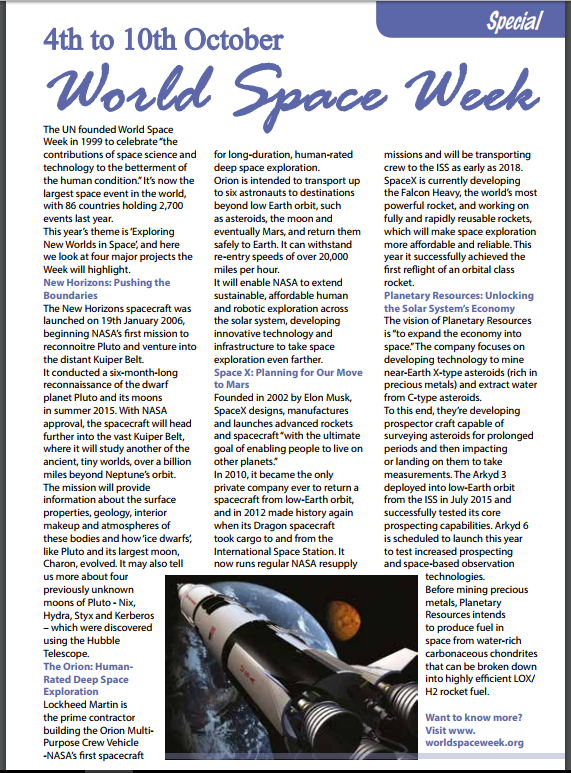 My topical article for October was about World Space Week. It was fun to research something that didn’t fall into a health or history category! It was fascinating to learn about not just the work NASA is doing, but the work being undertaken by private companies determined to help humanity explore deep space, colonise other planets and benefit from the resources the universe has to offer. In our lifetimes, we may see a team go into deep space on the Orion Multi-Purpose Crew Vehicle that Lockheed Martin is building for NASA – opening up the universe and its secrets for us. Meanwhile, Elon Musk’s Space X company is already shuttling cargo back and forth to the ISS, set to add crew members to its manifest as early as next year. The reusable rockets it’s working on could revolutionise the way we see space travel by making it much, much cheaper and convenient. And if Planetary Resources have a say in the matter, we may also see the production of rocket fuel in space (from water-rich carbonaceous chondrites) and the mining of asteroids for precious metals. NASA itself is not idle, of course, intending to investigate the Kuiper belt and deepen our understanding of ice dwarfs and how they evolve. As for me, I’m torn between thinking these billions could be better spent here on Earth and acknowledging that many technologies developed for space eventually benefit people right here – and that, with the state of the Earth already, perhaps planning for safe boltholes is an entirely sensible option. If you’d like to delve deeper, why not visit the World Space Week website yourself, which has links to the projects and companies at the forefront of space technology and exploration. 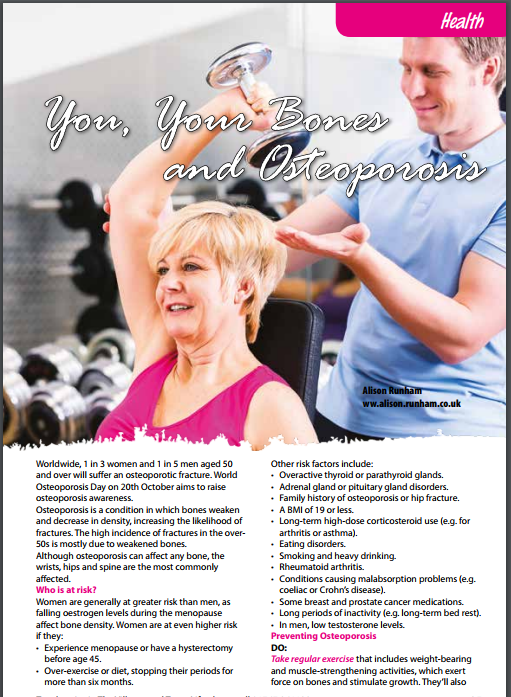 It was World Osteoporosis Day on 20th October, so not surprisingly, when I looked ahead for subjects to pitch for this month’s health column, osteoporosis was top of my list. 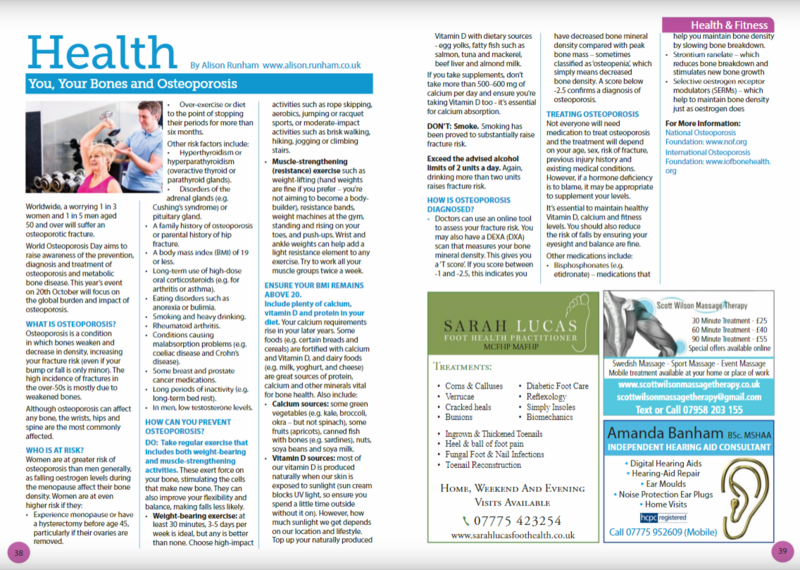 My health column discussed what osteoporosis is – a weakening of the bones and a loss of bone density – and also what causes it and what you can do to prevent and treat it. 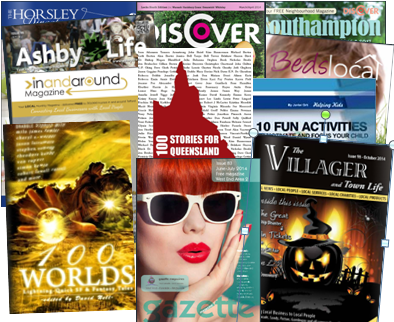 It’s appeared in various print magazines and on some websites too. So, how likely is it to affect you? Quite likely – particularly if you’re a woman. 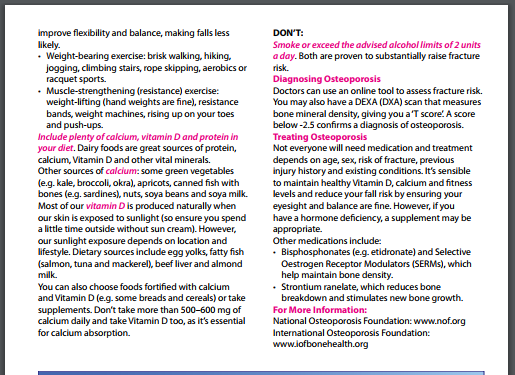 Worldwide, 1 in 3 women and 1 in 5 men aged 50 and over will suffer an osteoporotic fracture. Us poor women are at greater risk after menopause because of our falling oestrogen levels. Hyperthyroidism, a BMI of 19 or less, smoking and heavy drinking are some of the other top risk factors. Osteoporosis can affect any bone, but the wrists, hips and spine are the most commonly affected. You can help to prevent it by taking regular weight-bearing and resistance exercise and ensuring you have plenty of calcium, protein and Vitamin D in your diet, The exercise will not only help you maintain your bone health but also help you maintain your flexibility and balance – meaning you’re less likely to fall! Go and eat a yoghurt immediately – and jog to that fridge, lifting weights as you go!